Proactive involvement of the legal department in compliance, risk, and audit is key to effective GRC strategy. Legal plays a critical GRC role — from regulatory interpretation and policy design, to involvement in third party due diligence and compliance investigations, to advising both internal audit and risk management based on legal findings. Yet, in too many organizations Legal is largely positioned to only be reactive, to only get involved after it is too late. To be effective, processes and technology should be designed to enable tight cooperation between GRC and Legal staff and to facilitate their essential communication. With this infrastructure in place, companies are better equipped to mitigate risk, proactively address their rapidly changing business environments, and achieve compliance. Regulatory changes, or changes in operations that give rise to different regulatory requirements, are not missed. Third parties are engaged only after appropriate due diligence. Investigations are organized and well supported. 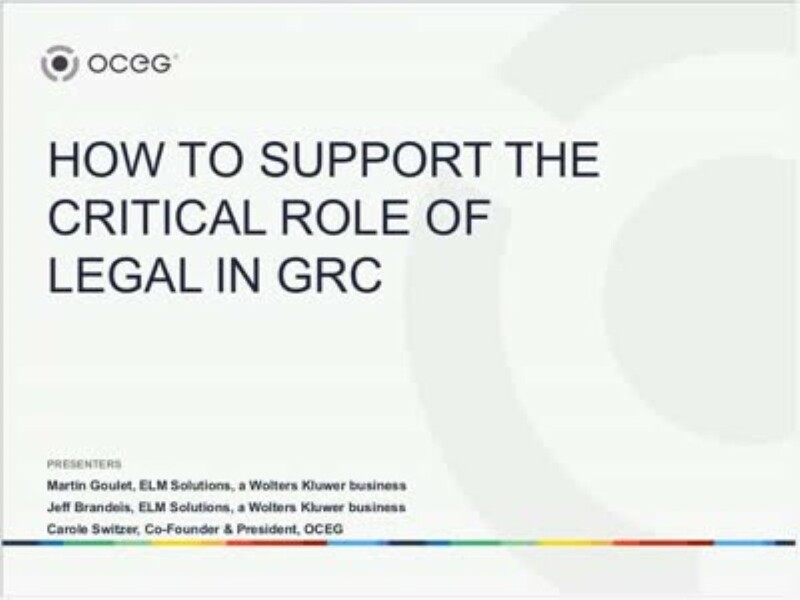 We have emailed instructions to access How to Support the Critical Role of Legal in GRC to . Make sure the email arrives in your inbox: either add "support@oceg.org" as a safe sender to your email platform, or if you use Gmail, drag our email into your Primary tab.